Over the past few weeks, our new External Affairs Director, Dr Adam Read has been busy touring the country and getting to know what goes on backstage at SUEZ. Following his visits, Adam put together a series of short blogs giving you a flavour of what goes on at each of the visited sites. The final stop of day two of my ‘busman’s holiday’ involved several hours on a construction site in Shepperton, right by the M3! Charlton Lane is the latest development as part of the SUEZ and Surrey County Council Private Finance Initiative (PFI), the site and technology being selected after a lengthy period of opposition to previous sites and previous energy-from-waste (EfW) technologies. The new Eco Park, expected to open in 2018, will host a 40,000 tonne per annum anaerobic digestion (AD) plant, dealing with much of the food waste collected in Surrey. Along with this, a fluidised bed gasification facility, which is capable of turning 55,000 tonnes of black bag waste into 2.4MW of power every year. What happens in the anaerobic digestion plant? 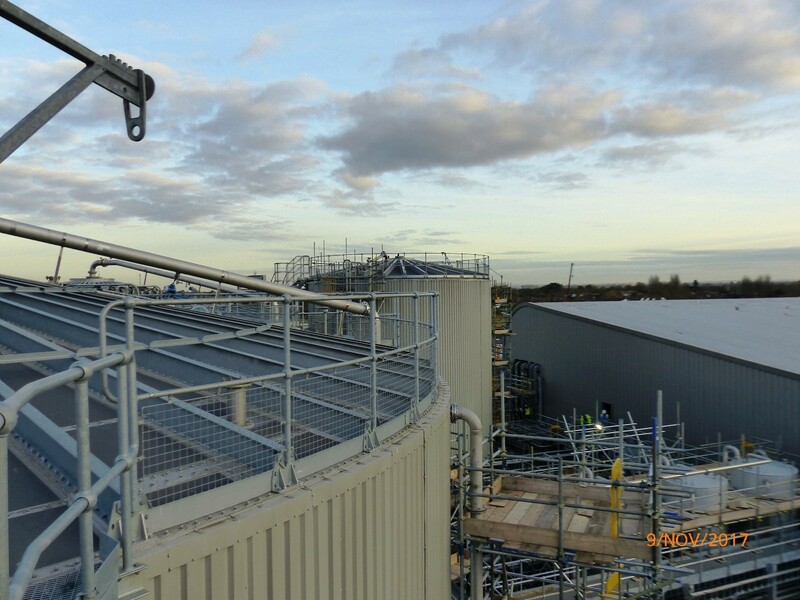 The AD plants is almost complete, and I was lucky enough to climb to the top of the digestion tanks so I could see all of the connecting aspects of the facility, which was dominated by cabling to control energy inputs and outputs. When the food waste arrives at the AD plant it is shredded, water is then added to develop a ‘slurry’ which is then pasteurised using heat from the gasification facility. In the next stage it is fed into two digester tanks where the material is processed for 18 days, prior to adding air to kill off the microbes. The slurry is then centrifuged to separate the digestate which is then loaded onto lorries for transportation to end markets and farms. The remaining water is then recirculated on site. What happens in the gasification facility? Prior to entering the gasification facility, materials undergo a pre-treatment stage to produce a refuse derived fuel (RDF) type fuel, which shreds the incoming materials and sorts out unwanted items including oversized materials. 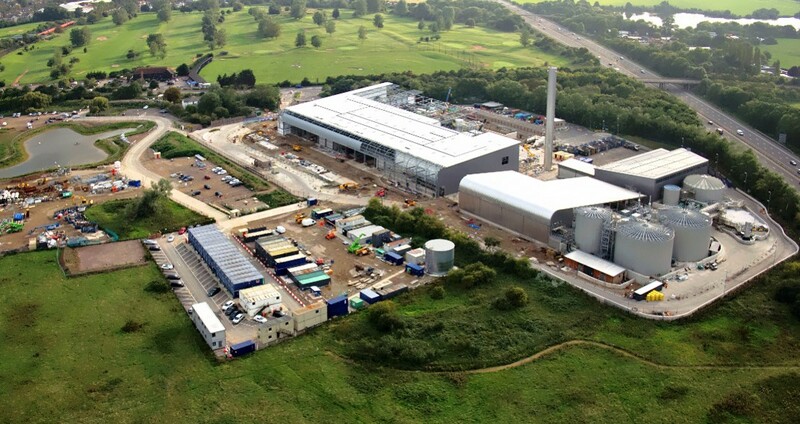 The stack on-site is only 49m tall, compared to the building which is 22m high, which is significantly shorter than the 119m stack at Severnside energy-recovery-centre. This is due to the technology being used, and the quality of the emissions. A smaller stack was a key part of the site’s planning approval and for local public acceptance. This was a particularly busy site, with construction being led by third parties, but SUEZ presence as the client and ultimate operator of the Eco Park was evident and the high standards we expect were clear to see.